"Our purpose is to promote the use of the Ludlow Auditorium for the benefit and entertainment of the people of Ludlow, the surrounding Black River & Okemo Valley area, and its visitors"
While You're here, take a look at what FOLA is all about . . .
At its annual meeting in January, FOLA elected new officers and began developing new plans for the forthcoming year. Scott Stearns was elected as FOLA's Chairperson, Jim Alic and David Almond continued as Vice-Chair and Treasurer respectively, and George Thomson assumed the post of Secretary. Scott agreed to temporarily continue as Program Director until a suitable replacement could be named. Scott indicated that FOLA would be implementing new programs in 2019 to continue improvement of programs offered to audiences and organizations. For the past year, FOLA has offerred an advance preview of its coming events on a TV program called "FOLA Present" aired by Okemo Valley TV on Comcast cable channels 8 (Ludlow, Plymouth and Cavendish) and 20 in Mt Holly as well selected VTel channels. The purpose of the presentation is to advise viewers of the coming month's schedule of FOLA events. Information about each comng event is supplied as well as graphics heatured in them. Pictured above are FOLA chairman, Scott Stearns and Treasurer, David Almond, in the latest episode of "FOLA Presents". Jim Alic is also a frequent contributor to the program. With the kind help of Wright Construction of Mt. Holly and LaValleys of Ludlow who supplied the paint, both the stage floor and the back stage areas of Heald Auditorium received two coats of new paint. Below, the Wright Construction crew is pictured. They are, from left to right, Chris Lafrenier, Rich Butrimas, Scott Grover, Scott Robertson, Joe Poston, Gordon Ashcroft, Carl Lavallee II, Sara Lavallee, Cody Lavallee, Autumn Lavallee , and Carl Lavallee III. In addition to giving the floor a well-deserved coat of paint, Wright Construction also removed an extremely heavy piano harp which had plagued us since we dismantled the old piano. 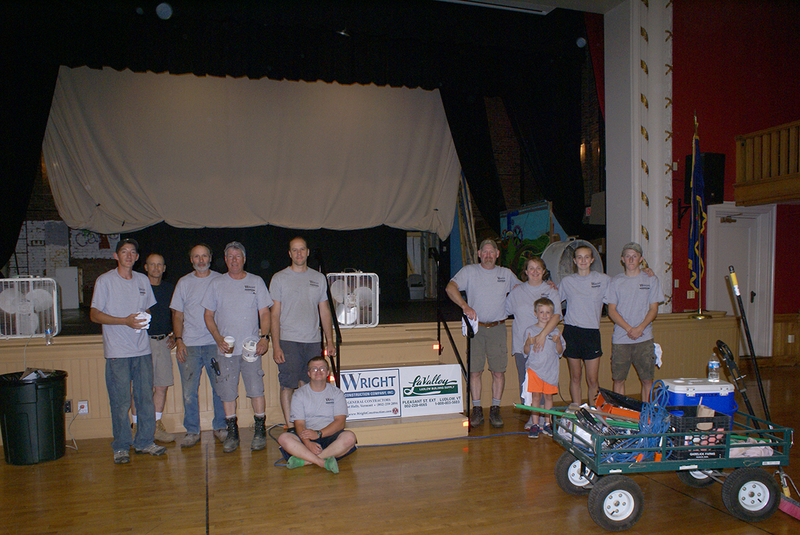 Many thanks to the folks at Wright Construction and LaValley for their help in restoring the stage floor - and removing the piano harp! Miss seeing the great Christmas 2018 Program? Just Click HERE for the entire show! Checkout FOLA's Summary of Activities and Accomplishments by clicking HERE. A Great Peter Sellers Movie Series Continues with "The Return of the Pink Panther"! FOLA will begin its annual special movie series for 2019 on Saturday, April 13 at 7 pm in the Heald Auditorium at Ludlow Town Hall. There will be a pre-movie reception (with snacks) with Vermont film historian Rick Winston at 6pm. This year's series will feature the films of Peter Sellers, starting with the hilarious comedy, "The Mouse That Roared". This year’s film series demonstrates the range and breadth of Peter Sellers as an actor, starting with The Mouse That Roared from the 1950s to “The Return of the Pink Panther” and “Being There” from the 1970s. To kick off the film series there will be a pre-movie reception (with snacks) starting at 6pm on April 13 that will be followed by a brief presentation by Vermont film historian Rick Winston (pictured) about Peter Sellers and his films. People are welcome to come at 6pm to grab a bite to eat and chat with Rick before we start the movie at 7pm. FOLA would say thanks to our generous sponsors for this year’s film series: Big Eyes Baker, Ludlow Rotary, Marylou Scofield, Attorney at Law, and The Book Nook. As with all FOLA movies, the movies free and open to everyone; donations are appreciated. For information, call 802-228-7239 or visit the FOLA website at www.fola.us. FOLA’s annual Film Series highlighting the movies of Peter Sellers continues with a screening of “The Return of the Pink Panther” on Saturday April 27 at 7pm in the Heald Auditorium at Ludlow Town Hall. Sellers reprises his role as the famously inept Inspector Clouseau, who is called in once again to catch the thief who has stolen the famous diamond, the Pink Panther. “The Return of the Pink Panther” is the third movie in the Pink Panther series (over ten years since the second one, “The Shot in the Dark”, had been released). Peter Sellers once again plays the idiotic Inspector Clouseau, who despite having been temporarily demoted to a cop on the beat is once again tasked with catching the thief who has taken the Pink Panther diamond. Unbeknownst to Clouseau, his boss, Chief Inspector Charles Dreyfus (played by Herbert Lom) has become so exasperated with Clouseau that he is trying to kill him. The bumbling detective travels to exotic locales all over Europe in pursuit of the jewel thief, Sir Charles Litton aka the Phantom (played by Christopher Plummer). It’s a slapstick comedy and a crime thriller wrapped into one hilarious movie. Don’t miss the post-credits scene to find out what happens to Chief Inspector Dreyfus. Please join us this spring for a set of wild and hilariously Peter Sellers movies. “The Return of the Pink Panther” on Saturday April 27, and “Being There” on May 11. All movies start at 7pm. “The Return of the Pink Panther” is open to everyone and is free (donations are appreciated). The movie is rated G and runs one hour and fifty three minutes. Berkshire Bank will provide the popcorn with FOLA supplying water. This movie has been specifically sponsored by Big Eyes Bakery and Ludlow Rotary. For information, call 802-228-7239 or visit FOLA's web site at www.fola.us. We're planning on additional improvements this year and hope you'll continue to help us present quality entertainment and public service programming in the beautiful Heald Auditorium in the Ludlow Town Hall.